THIS BLADE IS SIGNED AND I HAVE BEEN TOLD THAT IT IS BY A NOTED MAKER. I LOST THE SHEET THE GUY GAVE ME AND ANOTHER PERSON READ IT AND SAID IT WAS A STRAIGHT BLADE BY UJI NOBU SOSHU SCHOOL EARLY SHINTO. THE HABAKI APPEARS TO BE SILVER BUT I AM NO JEWELER. THE MENUKI APPEAR TO BE FLOWERS. THE FUCHI I CANNOT REALLY TELL WHAT IT IS LEAVES/SHELLS??? SOME PARTS APPEAR GOLD. THE RAYSKIN AND WRAP ARE IN GREAT SHAPE. 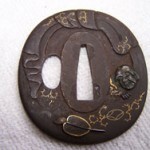 THE TSUBA IS VERY NICE AND UNSIGNED. IT HAS SOME GOLD INLAY AND A GOD’S HEAD, NOT SURE WHICH GOD. THE TEMPER LINE IS WAVY AND NICE. THERE ARE NO CRACKS, BLISTERS OR OTHER BLEMISHES IN THE BLADE. THERE ARE NO NICKS, DENTS OR GOUGES IN THE CUTTING EDGE. THE BLADE HAS SOME LIGHT CARBON STAINS HERE AND THERE, AND A FEW LIGHT SCRATCHES OR SCUFFS. THE SHEATH IS BLACK PAINTED WOOD WITH PLAIN BRASS WRAP AT BOTH ENDS AND THE MIDDLE. 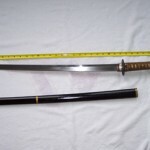 THE TOP OF THE BLADE FROM THE POINT TO THE FRONT EDGE OF THE HABAKI IS JUST OVER 25 INCHES. 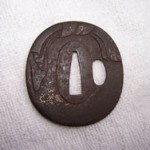 ALL THE WAY TO THE TSUBA IS 26 INCHES. 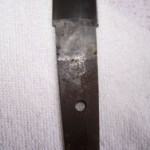 THE WIDTH OF THE BLADE AT THE HABAKI IS JUST OVER 1.25 INCHES. 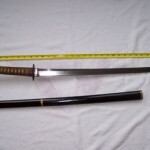 THE THICKNESS OF THE BLADE AT THE HABAKI IS OVER .25 INCHES. THE HANDLE IS IN GOOD SHAPE WITH NO FRAYING OR SKIN LOSS ETC. IT IS A GREAT SWORD AND I REALLY HATE TO SELL IT.